Resistance thermometers are one of the most accurate and reliable methods for monitoring temperatures in industrial processes, especially sanitary processes. Resistance temperature detectors (RTD) operate on the principle that the electrical resistance of metals varies by temperature. The expansion and contraction factor of metals like platinum and copper is unvarying over a long period of time, so RTDs will continue to deliver accurate temperature measurements for years. Note that a 4 wire RTD is both more accurate and more expensive than the common 3 wire RTD. WIKA has developed a line of RTDs especially designed for the sanitary industry. 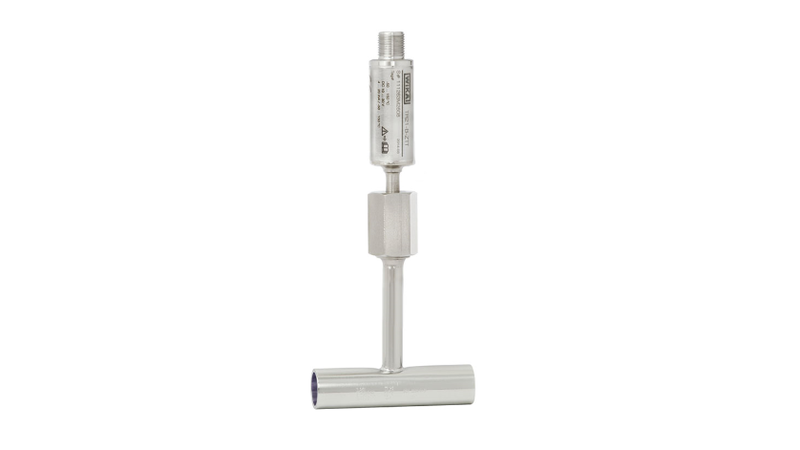 These rugged sanitary instruments always deliver a consistent temperature measurement because they have a spring-loaded tip that holds the sensor in place at the bottom of the thermowell. Moreover, the WIKA model TR 21-B miniature resistance thermometer and TR 22-B resistance thermometer have been designed from the ground up to avoid process contamination. These sanitary RTDs designed for orbital welding connections have smooth ends so there is nowhere for fungal or bacterial growth to occur. Equally important from the perspective of a sanitary industry process engineer, the sensor can be removed for calibration or repair without having to break the seal of the process or disconnect the electrical connection. This eliminates a significant contamination risk, and also means downtimes can be notably reduced. Both the WIKA TR 21-B and TR 22-B offer a stainless steel connection head with optimized hygienic design that eliminates all dead spaces. This sanitary-industry-friendly resistance thermometer is also self-draining and easy to clean in all mounting positions. The connection ends of the instrument are straight and surfaces are smoothed and prepared for orbital welding. The process connections meet all of the stringent material and design standards for hygienic measuring points. Both of these specialized sanitary industry RTDs are constructed with wetted parts from highly resistant stainless steel 1.4435. These instruments are designed to measure the temperature of liquid and gaseous media from -30 °C to +150 °C (-22 to +302 °F). The TR 22-B is available with direct sensor output (Pt100, 3 wire or 4 wire versions), or integrated transmitter with 4 … 20 mA output signal, which can be configured individually with WIKAsoft-TT software. The measuring range, damping, and error signaling rate can also be adjusted. The TR 21-B can be equipped with Pt100 (3 wire or 4 wire versions), 4 … 20 mA output or HART® protocol, FOUNDATION™ fieldbus and PROFIBUS® PA output. Intrinsically safe versions of both devices are also available for applications in hazardous areas. Let WIKA’s expert technical support staff help you understand the many advantages WIKA’s line of thoughtfully designed sanitary industry products. Let us put our six decades of instrument experience to work for you.